'Whistling Dixie' ( Mary Dunn, R. 1994). Seedling L122-4. LA, 38" (97 cm), Midseason bloom. Velvety red plum purple, small yellow signal; ruffled. 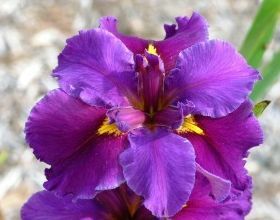 L78-1: (('Blue Shield' x 'Black Widow') x 'Full Eclipse') X 'Clara Goula'. Bay View 1995.